How have I never read this book? I don’t know, but when I saw that the movie was coming out, I told my kids that we needed to read it! We have been diligently reading almost every night to get it read in time. Whew! We finished! I sure hope the movie is good! (Look for my Book vs Movie showdown coming after we see the movie next week.) Are you looking to read the book or wondering what all the hype is about? 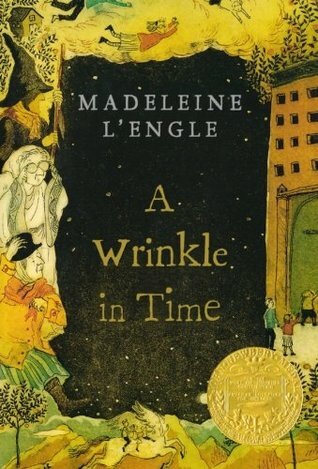 Read my book review of A Wrinkle in Time by Madeleine L’Engle to find out what we thought. “Out of this wild night, a strange visitor comes to the Murry house and beckons Meg, her brother Charles Wallace, and their friend Calvin O’Keefe on a most dangerous and extraordinary adventure—one that will threaten their lives and our universe. Wow! What an adventure! A Wrinkle in Time takes you on a journey through the universe. Have you ever wondered what’s out there? Do you ever look up at the stars and imagine who or what lives on those planets, and what the stars are made of? Do you ever dream of traveling through the universe? Well then this book is for you! It’s very unique and imaginative. It seamlessly mixes fantasy and science fiction into an incredible tale of courage, sacrifice, and love. I read this book aloud to my kids, and it was so fun to take this journey together. Even my 16 and 14 year-old boys sat with us. I thought it worked great as a read aloud. There are quite a few exceptional vocabulary words, and so it was good that I could explain (or look them up) if needed. I think it works for a read aloud for about 2nd grade and up, and as a silent read for middle-graders and YA. I thought it was written well. The characters are so likable and realistic. Charles Wallace differs a little; he’s very likable, but a little hard to relate to. He’s very young and very smart. He reminds me of the main character in Ender’s Game. Meg thinks she’s ordinary, but does some extraordinary things. I love Calvin. He’s a sweet, thoughtful, smart, and caring friend. It’s hard not to like Mrs. Whatsit, Mrs. Who, and Mrs. Which. Yep, you read that correctly! The story definitely takes you out of this world! Some of it is WAY out there. I had a friend tell me that she could never get into this book because of how far out there some of it is. I did feel that some of it was hard to grasp because it’s so unique, but since I was reading it with my kids I had to keep going. Once you let go of your boundaries and let your imagination take over, the story comes to life. We all enjoyed it. As a mom, one thing I loved were the lessons learned. You get to see courage, sacrifice, bravery, and love in action. The characters do hard things that they don’t want to do, but they do them anyway. They learn to trust each other, and to trust themselves. I also love how much you need to use your imagination. As an adult, mine may not get used as often as it should, and it’s fun to delve into this crazy universe of ours. Age Recommendation: Middle-graders (4th-6th) and up as a silent read and Early Readers (2nd-3rd grade) and up as a read aloud.